There is mounting evidence that the economic globalisation project initiated after the fall of the Soviet Union is not keeping its promise of open societies and a freer exchange of goods, knowledge, ideas and more social justice. In fac, there are strong indications that such benefits are not equally divided, so between north and south and developed and developing countries. Responding to this evidence, the International Labour Organisation (ILO) established the World Commission on the Social Dimension of Globalisation in February 2002. In February 2004, following numerous international and regional conferences and consultations, the Commission's report, A Fair Globalization: Creating Opportunities for All, was presented to the Governing Body of the International Labour Organization, to the Secretary General of the United Nations, and to the heads of other UN agencies, the World Bank, the International Monetary Fund, and the World Trade Organization. This volume represents the first in-depth evaluation of this important report. 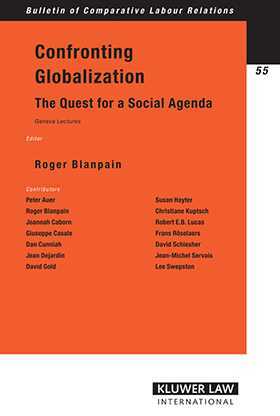 Several authors deal with the role played by other international organisations like the OECD and the EU regarding the social aspects of globalisation. Two important EU documents on the promotion of core labour standards and on the social dimension of globalisation are reprinted here. Treating as it does one of the major problems our generation-how to see to it that globalisation benefits all of us and not only a few-Confronting Globalisation: The Quest for a Social Agenda promises to take its place as an indispensable resource for practitioners in many fields, from labour and employment law to health care and environmental policy. It is not too much to say that this book represents an immensely valuable contribution and commitment to the future well-being of the world we live in. Introductory Remarks: the Globalization Debate at an Impasse. 1. The Social Dimension of Globalization: Striking the Balance; S. Hayter. 2. ILO Standards and Globalization; L. Swepston. 3. International Labour Standards and Corporate Social Responsibility; J.-M. Servais. 4. Globalisation, Labour Law and Industrial Relations: Some Reflections; G. Casale. 5. Promoting Core Labour Standards and Improving Social Governance in the Context of Globalisation; EU Commission. 6. The Social Dimension of Globalisation the EU's Policy Contribution on Extending the Benefits to All; EU Commission. 7. The IOE; J. Dejardin. 8. The ICFTU and its Policies within the ILO Workers Group; D. Cunniah. 9. The Challenge of Child Labour; F. Röselaers. 10. Protected Mobility for Employment and Decent Work: Employment Security in a Globalized World; P. Auer. 11. Globalization and Higher Education: The Migration of Students from Developing Countries to Western Europe; C. Kuptsch. 12. International Migration to the High-Income Countries: Some Consequences for Economic Development in the Sending Countries; R.E.B. Lucas. 13. The ILO¿s Educational Programme Addressing Psycho-social Problems at Work; D. Gold, J. Caborn, D. Schiesher. 14. Differences in Treatment and Discrimination Relating to Age. A Society for All Ages; R. Blanpain. 15. Globalisation and Workers Participation; R. Blanpain.